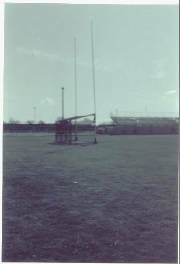 Gaelic Park in Chicago is one of the premier GAA fields in the world. It is second only to Croke Park in Dublin, the GAA's HQ. The Red Branch were fortunate enough to travel there for a coach's clinic back in April of '04. It's a fantastic facility with a great pub, large banquet rooms and 10 full size Gaelic fields! Click on fotos to enlarge.